Tonight I am in the mood to listen to Russian poetry recitation, so I found these clips. The first clip is from a tv film series "Esenin" about the life and death of Sergei Esenin. It is very well made and captivating, and we watched the whole series within a day or two. The second is not related to the film. Here is a brief biography if you are interested. franklin graham, not my friend! I just read this article about Franklin Graham's Festival of Hope in Kiev, Ukraine. This is a good example of why the Orthodox Church is not happy about the Westernization of...I mean crusade into...I mean evangelization of Russia and Ukraine by Protestant Church, Inc. The opening line spoke of the beauty of the golden churches in Kiev "A feeling of Old Testament gravity and ritual hangs in the air." "He was a very religious man ... conscientious in all his religious duties.” But for all of that, he said, Nicodemus was still troubled in his soul, unsure of how one is able to stand before God. So he went to Jesus by the cover of night to ask Him. “When Jesus answers his question, ‘You must be born again,’ Nicodemus must have been stunned,” Franklin said. “He was a Pharisee, the strictest of all religious sects. They dedicated their lives to upholding the law of God.” He continued, “You see, religion is not enough to save you.” After being in their country just a while, Franklin said, he could see Ukraine was a very religious nation—but, like Jesus told Nicodemus, religion is not enough. We have to be born again. Graham takes cheap shots at Orthodoxy, shows a complete lack of understanding of her teachings and misleads people by telling them that the Church does not believe in salvation by grace but by works. You'd think these "great wise" leaders would be the ones most educated about other faiths so as to have a better understanding of their own. I guess not. Or does he know the truth and yet choose to mow over it in order to win more to his side? I could go on and on about the issues I have with Big Chrisitanity's evanglization efforts in Russia....but I'd better not. All I'll say is GO SOMEWHERE ELSE. But, Glory to God, despite such efforts to elbow out Orthodox culture, the Russian Orthodox Church is bouncing back and is continuing to grow. The blood of the martyrs is bearing great fruits, and the unity of the Church is even stronger than before. I heard about this article from Fr Stephen's blog. He is much more graceful and helpful in his response in "The Orthodox Church and Personal Salvation". We were going through our huge stack of mail tonight and came across a strange envelope. At first I thought it was just a cheesy thing from a church, but what we found inside looked more like a cult...except I'm sure it's a total FRAUD. It sounds exactly like those emails I get from people in Nigeria trying to send me millions of dollars if only I'd fly to England to pick it up. These guys are "Saint Matthew's Church"...yeah right. Let this be the best year of your life through faith and prayer. God is ready to help you reach your dreams and goals. We believe that you are about to be blessed through this unusual, Bible Faith, Church, Prayer Rug which we are placing in your care for these next 24 important hours. When you use this Faith Church Prayer Rug, go into a room where you can be alone (just God and you)...try to be by yourself when you kneel on this Holy Ghost, Bible Prayer Rug, or spread it over your knees. We want this Church Ministry, Prayer Rug to be touching both of your knees as you pray for the needs you are facing right now. These next 24 important hours are crucial to you. Timing is important to God. After you kneel on this Church Prayer Rug, or place it over your knees, place it in a Bible, on Philippians 4:19. (If you don't have a Bible, it's okay - just slide it under your side of the bed, for tonight, if you can.) Leave It There No Longer Than Tonight Only! God sees. Then, in the morning it is a must that you get this unusual blessing church Prayer Rug out of this house and back to us, here at the church's chapel prayer room, in faith...so we can rush it onto another family that's in need of a blessing. Pray about sowing a seed gift to the Lord's work. Give God your best seed and believe Him for His best blessings. And say "Yes, I want one of those Deuteronomy 8:18 Prosperity Crosses, blessed for me by the church." ps. Read your faith, Holy Ghost instructions on the enclosed, sealed prophecy, only after you have mailed this Prayer Rug back to the church for your blessed Deuteronomy 8:18 Prosperity Cross. Lots of stories of people being blessed with thousands of dollars and/or healings. The Prophecy was totally vague, of course. I'm contemplating mailing these goodies to the local investigative news station for their records. Obviously this letter finds all the highly suggestible people who will do exactly what they say. I'm sure they would be telling me to send money in the next letter. Anyway, this was our entertainment for the night, though a bit of a bore to read about, I'm sure. It was kind of interesting to see the "subliminal messaging" (thought it was pretty obvious). I'm sad for the people who fall for it. At baptism, Orthodox Christians take a saint's name. This saint becomes their patron saint. During morning prayers, we say "Saint ___, intercede to God for us." 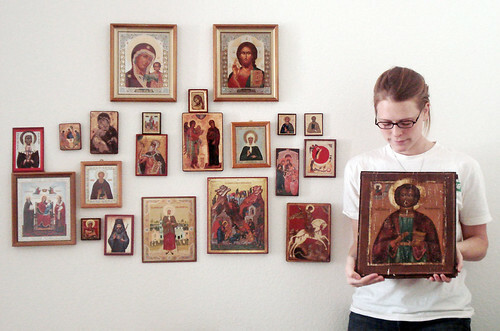 The saints are depicted in icons--paintings--that line the walls of Orthodox churches, our homes (living room, bedrooms, kitchens), sometimes our desk at work, often in our cars and anyplace that is appropriate! Here, you can share a portrait of yourself or someone else with their patron saint or another icon that is important to them! As one member of this group has mentioned in comments, the process of taking the one picture is not to be taken lightly. It can, however, be very motivating and inspiring to have a specific occasion for which to ponder upon our relationship with Christ and His saints. For moderation purposes, you have to be invited to join the group. If you're interested, we'll figure out a safe way for me to get your email so I can sen you an invite. Many think of horned demons in hell pushing people around with pitchforks. However, our sinful passions in this life will be our real tormentors in eternity, for we will be separated from our flesh which is able to feed them. Our souls will burn with insatiable desire and frustration because we will have all that we desire but no way to enjoy it. find themselves unscathed; others will survive, though greatly reduced; perhaps some will almost perish, but the purifying flames will compel them to repent; and others will be completely lost in the fire, for they will have committed their whole selves to to the world in sin and will have nothing left for eternity. Will they burn so completely that they cease to exist? Lord have mercy on me, a sinner. Though I have done nothing good in Thy sight, yet grant me by Thy grace to make a good beginning! And grant me repentance before the end!